Seriously, I'm just looking for the nearest couch. His massive head, saucer-sized paws and overall enormous presence makes it hard to miss a bullmastiff lumbering by on the sidewalk. He's got built-in guarding instincts but, as is the case with most canines, the only ones that are dangerous are those with misguided or inadequate human leadership. English estate owners and their gamekeepers developed the bullmastiff in the mid-1800s by crossing mastiffs with bulldogs, hoping for a guardian with less fierceness than the bulldog but more speed and forcefulness than the mastiff. The gene tampering produced an impressive protector that stands as high as 27 inches at the shoulder and weighs as much as 130 pounds. 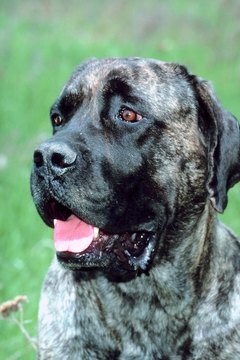 The bullmastiff may be red, tan or brindle. Bullmastiffs are agile despite their size, but they have a lower energy drive than most smaller dogs. These colossal pups will be content in either a home or apartment -- especially if you provide a couch large enough for their spudlike tendencies. Unlike retrievers and other sporting breeds that labor alongside their humans and respond to directions, guard dogs such as the bullmastiff were bred to spend much of their working time alone patrolling properties. This gives them an independent attitude that sometimes comes across as stubborn disobedience or less-than-super intelligence. The fact is, a bullmastiff is used to thinking for himself and often sees little use in repeating an action, such as “sit,” over and over again. Thanks to the original breeders, who preferred their guard dogs to catch but not maul poachers, bullmastiffs are fearless and confident -- yet they have a docile temperament and a desire to please their people. Your bullmastiff may have a kind and gentle personality, but his size means he needs to be socialized early and trained consistently. He won't stay little for long. Even shy of his first birthday, he can probably drag you wherever he wants on a walk and move right through most things in his way. He'll respond best to patience, positive reinforcement, consistency and gentle but firm guidance. Harsh training methods can create aggression. Starting with a puppy obedience class will help socialize your gentle giant and develop your skills as his trainer. Don't hesitate to ask for a little one-on-one tutoring time with the class instructor if you're having difficulty convincing Rover you're his leader. Bullmastiffs, despite the purpose of their breeding, are suited to an indoor life; they crave lots of interaction with their human pals. They can become antisocial and quite aggressive if left outdoors alone or chained for long periods of time. Your large-as-life pup has a natural love for children but should never be left on his own with young kids. Even an innocent nudge with his overgrown body or an accidental impact with his rock-hard head can do serious damage. As part of their guard dog legacy, bullmastiffs are naturally territorial. If left to roam the neighborhood, he may eventually consider all of it his property to protect from strangers and other dogs.